So. The big threat of big weather on the East Coast came and went last week without much impact on DC (or anywhere else, for that matter), so my path was clear for research, and then, at the end of the week, for the quick trip that I had planned to mark the mid-point of my DC sojourn. So I zipped back home on Thursday evening, and by Saturday morning heard tell that a little weather was moving into the Chicago area–but paid it little heed. Here in the Midwest we tend not to get too upset about the weather that might be. We know it’s only weather if you notice it, so we have a hat and boots on hand. We never run out of bread and milk. There was not much talk about the potential onslaught on the news, or the social media, or in the tea leaves or anything–certainly not the scale of coverage that preceded the East Coast’s Storm-That-Wasn’t, where 24/7 Manhattan-centric coverage seemed to whip a lot of people into pearl-clutching fear for their foie gras supply in case the doorman was unable to shovel their way to the Dean & Deluca. By contrast, many of us in Illinois have inherited the attitude of our Scandinavian forefathers that is expressed in the Swedish saying, Det är ingen ko på isen: there is no cow on the ice. In short, without an actual calamaty breaking out in front of us, we get on with it. 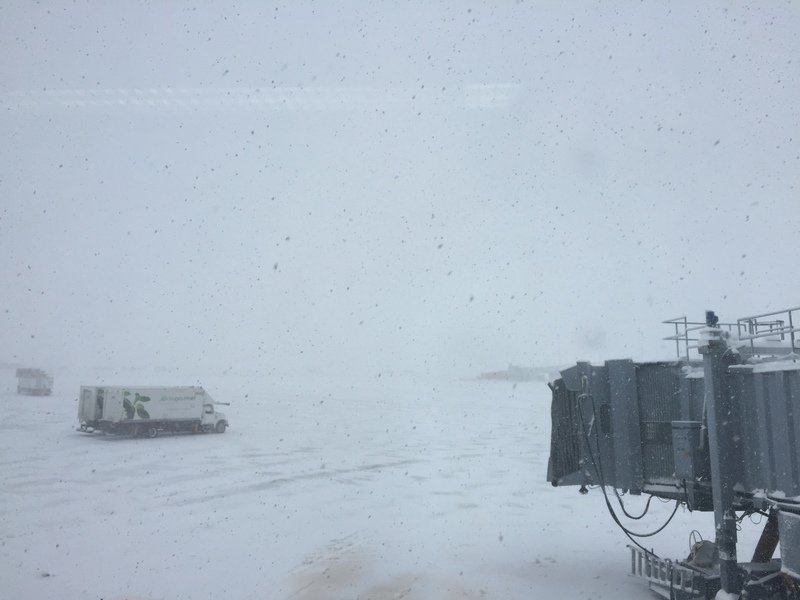 And so I dutifully showed up at the airport Sunday, even though it looked like bad weather both for taking the cow out and for driving an airplane through. But, I had a ticket to ride and a car with four-wheel drive, so off we went. 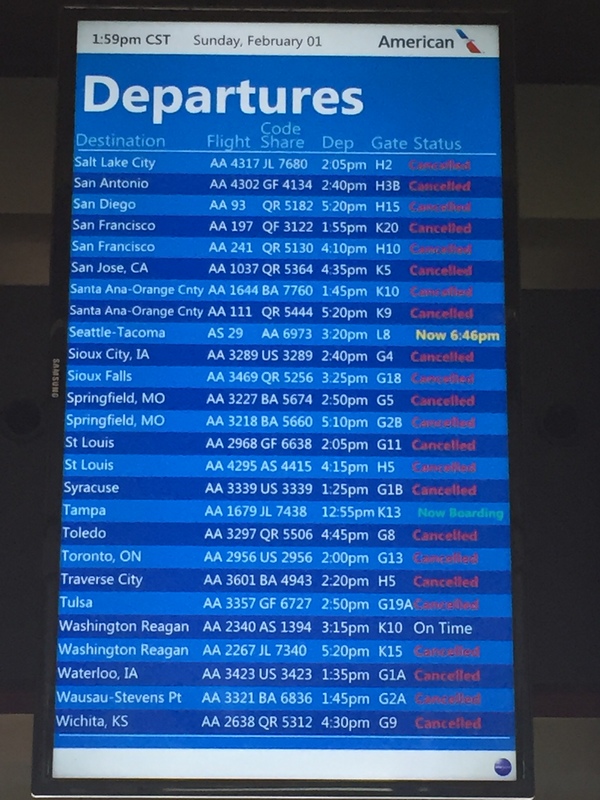 Although I was sort of unnerved by the vast open spaces at O’Hare, I thought, surely this will be an adventure, and fancied myself heroic to be on one of the very very very few flights leaving one of the world’s busiest airports on a day that some 1300 flights had already been cancelled by lunchtime. Other travellers arrived, then the gate staff. About 15 minutes before boarding time, we started hearing bad news. The late-arriving aircraft. The crew diverted to Minneapolis. Still we waited and watched, in the midst of near-whiteout conditions, as the snacks and soda, and then the luggage, were loaded on the plane. We remained optimistic. Then–only after we had boarded–the pilot started telling tales of a missing de-icing truck, and then a broken de-icing truck. It was clear that even he was losing his nerve when, in the midst of being be very nice and apologetic about 90 minutes after take-off time had passed, he admitted that our plans were “up in the air” (actually, really, I am not kidding). He reported that other pilots, who had made it to the runway, were turning around after finding it too slippery. About 15 minutes later he booted us off the plane–but stood at the cockpit door and apologized to everyone for their frustration as they left. By then driving was far too treacherous so I could not call my own crew to come and collect me, but was fortunate that (A) we have nice friends with a nice condo just four blocks from the Blue Line and (B) the Blue Line was running. Next day, after a very long ride on the commuter rail, I made it back to my starting point. Now I am camped out with everyone else in the family who is having a snow day, planning to make tracks again tomorrow, when the first available flight is scheduled to take off and return me to my regularly scheduled sabbatical research. If all goes well, I think I should be spooling a microfilm reader by 1:30. In the meantime, I don’t like the thought of all those nineteenth-century manuscripts that are sitting in a box in the dark in a DC library, starved of my attention. But, you know, weather happens. (And, for the record, it was serious weather: some 18″ or more at O’Hare and the town where I live; Chicago’s 5th-greatest snowfall, ever.) Last night, in the verrrrry long line that snaked away from the desk where airport people were trying to get us all rebooked on new flights, I was flanked by two very different kinds of travelers. In front of me, Late For My Conference Lady was spitting nails over the delay and the airline’s policy to not pay for hotels. Behind me, Just Trying To Get Home Guy was relating the multi-day journey that started in Tokyo and, he hoped, would deliver him home to Nashville at some point this week. “I just wasn’t supposed to win today,” he said. In the midst of a pretty stressful situation, I really appreciated his words, although I’m not quite so Zen about the whole thing. I really wish the Decider at my airline had chosen to cancel my flight earlier in the day so it would have unfolded differently; I wish I was not losing days of research. But in the big scheme of things, this is not the worst thing. Not-winning is not the same thing as losing, as long as you get where you need to go, without too much loss of opportunity or dough (or cows) along the way. And when missing a day and a half of research means gaining the chance to bake a few loaves of bread and feed them to my people, and take a little walk in the snow with the dog, that’s ok. On Sunday, I didn’t win the travel bowl, but didn’t exactly lose, either. No cows on the ice.